Vacation rental house. Sleeps 5, 2 bedrooms, 1.25 bathrooms. Dogs allowed. Have a great meal or a fun card game at this dining room table. See the clear blue ocean from the deck on the middle level of this three story home. Just a stone's throw from the Fiscalini Ranch. This 420 acre, oceanfront ranch is owned by the town, and open to everyone! There are trails like this one, which is great for dog-owners or bikers. There are also plenty of other trails, down near the ocean, up on the ridge, and all through the Monterey Pine trees. High Season Monthly Rate is in the $5,000 range, but please call our office at 805-927-1303 for a specific quote for the time of year you wish to come. The location was great. The home had everything we needed. My only complaint is the bed in the main room is not comfortable and the kitchen cabinets should be wiped down. Some of the cabinets were sticky. Other than that we all enjoyed our stay. As always we had the best time at the “crowd nest” it’s so convenient and very well looked after. My husband and I love sitting on the deck sipping the delicious local wine! Bliss! We loved our stay at the Crow's Nest! With ocean views, hot tub, BBQ, and washer/dryer, this place had everything we needed. It's ideally located next to the Fiscalini Ranch Preserve, so morning/evening walks observing migratory birds and sea critters became routine. I also appreciated the wifi and cable TV (vegging on the couch in Cambria is somehow way more exotic than at home!). It's a short drive to Hearst Castle, or the elephant seal beaches, or wine tasting, etc. We'll definitely be back! Great location, clean, well appointed, perfect for stay. We had a wonderful visit, as usual. Our dogs absolutely love Fiscalini and our daily hikes up into the hills. Looking forward to next year already. Perfect in every way! Just wish we could have stayed longer. Very good rental; great ocean view. nice decor. Very good rental; great ocean view and nice decor. Our visit to Cambria was wonderful and the location of this home was perfect. But anyone who is challenged by stairs should not stay here. We had a wonderful time at this charming little house just a few blocks from the beach. We had beautiful views of whales and other wildlife right out off the deck of the house and though small, this house had everything we needed. It is steps away from Fiscalini Ranch for hiking, biking and dog walking and the home even comes equipped with two bikes for guests to use. We got away at just the right time. It hit 113 degrees at our home the week we stayed at The Crow's Nest. In contrast the temp was in the 60's and 70's here in Cambria. Moreover, this was a wonderful property. Perfect for those with dogs and while there may not have been a direct doorway to the yard, we found a expandable barrier that alllowed us to block off the front entry stairs so that we could leave the front door open so the dogs could access the side yard to do their business and the front porch so they could say hi to all the people and dogs on their way to Fiscalini Ranch. When we discovered the microwave was not working when we arrived they had it replaced the next day (Sunday!) Our only criticisms, which have been mentioned before, had to do with the master bed and the couch. If you are a cyclist this is a great HQ for the many rides in the area. If you want a quick warm up you can climb out directly to the east, or if you aren't in the mood for the 18% grade, you can take the packed gravel road thru Fiscalini Ranch which is virtually flat and allows easy acces to the north entrance to Cambria or Hwy 1. The Crow's nest turned out to be a nice location for three days with the grandchildren! We walked to the tide pools down the street every day. Went on daily trips to Hearst Castle, beach, visiting elephant seals all a short drive away. The neighborhood is quiet. Only glitch we had was no show handyman when we called repair number given for microwave that stopped working. Said he would come next day but didn't. We had no microwave for two days but survived! Wonderful experience. 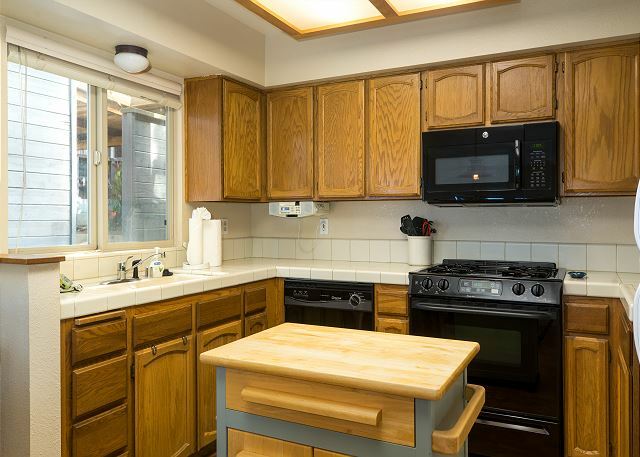 We have rented several homes in Cambria over the last 12 years and this is our favorite! We had a great stay at Crow's nest and would definitely stay there again. Even with 2 couples, a baby, and a dog we still felt like we had space to spread out and enjoy the house. The location is tucked out of the way near a gorgeous 400+ acre ocean front preserve, but only a 5 min drive from Main St in Cambria. The hot tub is great. The grill is great. And the space behind the house made for a fun area for all of us to hang out and enjoy the weather while safely containing our dog and 2 year old. My only critical comment was that the house isn't set up well for a toddler. There are lots of stairs and opportunities for little ones to fall. Also the house has a lot of kitsch to give it that beach front feel. When we arrived, we immediately had to round up and stash all the coffee table books, magazines, tourist pamphlets, 8 candles, sea shells, lamps, and trinkets that kids can easily damage. Not a biggie, just an FYI for families. The unit did have a kiddie gate to block off the indoor stairs - which we were very happy to have. Oh finally, we ran out of propane for the grill during our stay. When I called management, they responded immediately and refilled the tank - which was very impressive service for a laid back ocean town. The location was perfect- near Fiscalini Preserve and with ocean views. The house is well equipped and well maintained. It was not our first visit - and will not be our last. This is the 2nd home we've rented through Breen and we LOVED the Crow's Nest! Perfect size for us and our two mutts. We had everything we needed in the home, including an amazing view of the ocean and paces away from Fiscalini Ranch. What more could you ask for? We would definitely return to this home. We only needed the master bedroom since it was just the two of us, but it could accommodate more with the 2nd room. Oh and the hot tub was lovely on the starry cooler evening too. Great property! We had such a wonderful time, absolutely fantastic!!! Staying at The Crow's Nest, was a wonderful experience.....very clean, functional and very comfortable. My husband and I loved sitting on the balcony with a glass of the local wine watching the sunset. After a lovely long hike. The Crow's Nest is in a great location with a great view from the porch. The house was a great fit for our family of five. It was great to be just a short walk from Fiscalini Ranch Reserve. Our frequent walks with our dogs was relaxing and enjoyable. We had a great time at the Crows Nest. The location near Fiscalini Ranch Preserve was great. We hiked and biked there daily and went tidepooling. The house was perfectly comfortable for a family of 2 parents, 2 kids. We loved the hot tub (big enough for us and our kids but not for 4 adults). The house had a slight odor upon arrival - new paint or new carpet? Open windows helped. Kitchen reasonably well-equipped. Great place! this little gem was a wonderful retreat for us and our pups. so close to hiking and super clean. great views too! We rented this home over the Thanksgiving holiday and can't wait to go back!! It was wonderful to have our coffee each morning on the front porch overlooking the coastline. We also really loved its proximity to the trail on the cliffs and it was a quick drive to get into town. This was the perfect home for us to escape and relax! This was our third stay in this property and each time we have appreciated the quiet, the view and the location near the nature preserve. We hope to be able to return again. Very nice place, small but fine for us. Lots of stair climbing, which was a little difficult for us. Great..only bad was the master bedroom mattress. I would have given 5 stars ...but the mattress was sooo bad. We love it there, but woke up w/ sore backs. The hot tub was wonderful, and much needed. We would definitely come back and recommend to friends if the mattress is replaced. Otherwise, a perfect rental! We rented this house during the holidays and it was just perfect for our family. Having the trails just a few door down was a great location for early morning hikes with the family and dog. Also - the staff at Breen is the very best - friendly and helpful! Family from both northern & southern california converged on Cambria for Thanksgiving. The reservation was made only a month before, so there wasn't much choice left, but this location was just right for us. It's small, but fully functional, and wonderfully located. 3 blocks from the ocean, 1/2 block from Fiscalline preserve, and with very nice ocean views. Nice "extra" touches, mtn bikes to use, really fast internet, washer/dryer, hot tub. The house is very well insulated, quiet and comfy. The closest "negative", except in the kitchen, there are no good, bright lighted areas for reading. Dealing with the property management was excellent, laid back but everything taken care of. We truely enjoyed our get away. Our stay at The Crow's Nest was wonderful and relaxing. We really enjoyed early morning walks 4 houses down from us to Fiscilini Ranch with even more ocean views. The house was well equiped and the jacuzzin was a nice touch. Also, we have booked with Breen Vacation Station numerous times. They always take good care of us. This was our second visit to Cambria and our first time staying in The Crows Next. We loved the proximity to Fiscilini Ranch since we traveled with our Golden Retriever, George. He thoroughly enjoyed the twice daily walks on the upper and lower riidge. The "nest" itself was clean, comfortable, appropriately furnished and welcoming. THe only negative - and it's a small one - are the stairs. The stairway is narrow in this cute little place which was a little challenging for my hussband who has arthristis and slight balance issues. We managed, however, so I would not consider the staircase a deterent in the future. All ins all, we had a very lovely time and would consider treturning to Cambria and The Crows Nest in the furutre. Great location especially if you have dogs. Our pooches enjoyed their many walks around Fiscalini Ranch. Our only complaint is the bed in master bedroom was way too soft. We both went home with sore backs but enjoyed our stay anyway. Very happy with our stay in The Crow's Nest. Time went by to quickly. Fred R from Coarsegold, CA does not recommend this vacation rental. It was great for the most part but a little disappointed about the spa being nonusable. It was gross. When we tried to talk to someone they didn't seem to care. The best part was the biking and the location. We spent four nights at the Crow's Nest and enjoyed the ocean views from the living room and the master bedroom. The beds were comfortable and the kitchen was enjoyable to prepare meals in. The house was in a perfect location for us and out dogs. Walking Fiscallini every day was breathtaking. We were very pleased with the whole experience. This house was perfect--well-appointed, comfortable, had all the amenities. We loved the ocean views (and sounds), the quiet neighborhood, and the fact that it was so close to the Fiscalini Ranch. And our dogs loved it, too! The only tiny issue is that the towels were a bit musty--but we brought our own, so it didn't matter. We absolutely loved this place and will stay here again. Thank you, homeowners, for opening your home to us! Great location; easy walk to the coastal walking paths, easy to find and park. Loved it. I did already respond to this once, so I will be brief now. The place was great and Breen was excellent, but we were very disapointed that the hot tub did not work and it didn't seem that any effort was made to get it fixed. We picked this particular house because of the hot tub. My 3 star rating on question #2 is solely based on the fact the hot tub did not work. It's a very compact home but well equipped--perfect for a couple plus one or two kids. The location is great, adjacent to Fiscalini Ranch with a wonderful view. The house was great, close to ocean, trails! The main bed is very comfortable. All the furniture is very comfortable. The view if pretty good. Being next to Fiscalini is awesome. Some issues. To get to the highly chemicaled hot tub you have to go out the front door and around the back. The kitchen is not well stocked. We found the place mostly but not fully cleaned. We felt like we were home. The location was fantastic. We brought our dogs and thoroughly enjoyed being next to the ranch. The house was well equipped so we mostly ate at the house. The balcony and master bedroom have amazing views. We enjoyed our stay at the Crow's Nest. The location of the property and condition were great. When the smoke detector was beeping, in need of a battery, Breen sent a maintenence man right away. There could have been more dishes and water glasses in the kitchen. Also, you have to be ready for lots of stairs in that house, but it has a great view! Very comfortable unit in a terrific location for walks and an ocean view. We will be staying there again. We use to live on the central coast and so have to come revisit on a regular basis. Since we have a four legged member of the family this location was great. We know what to expect in Cambria but this exceeded our high expectations. The east village experience is wonderful. We have rented homes all over the state with mostly great service. However Breen was by far the best agency we have every used. We will be back soon, not soon enough for my wife however.lol. We have rented many homes in Cambria over the last 15 years and the Crow's nest is one of the nicest. Its a little on the small side but comfortable and well maintained. If you have dogs its important to know that the backyard is not accessible from inside the house. It was the perfect vacation experience and I'll be back for sure! even though the weather wasn't perfect, our stay at the crows nest was. it was very comfortable, although the beds could use and upgrade. no big deal though, the view and location made up for that. this place had everything you needed and we only wished we could stay longer or just move in it was that nice. great service from the staff at breen who allowed us to check in early and made our stay so convenient and soo enjoyable and relaxing!!! This home was in a perfect location and very comfortable. Beautiful views and very roomy for the square footage. So close to the Ranch and the beach. The Breen Vacation homes are so well kept and very well equipped. It is so nice to have a place to take our dog and it feels like home. It was fantastic!! It would be much more convenient to leave the keys somewhere at the location rather than having to drive back to town to leave at the management office. Also, beds are so important. It would be nice if the beds were more comfortable and of better quality. Beautiful view, home cozy, hot tub great! We had a lovely time. So wonderful to just walkout the door and up the street to walk in the ranch preserve by the ocean. great restaurants nearby. Seachest oyster bar and restaurant good, but overpriced. We had a wonderful weekend at the Crow's Nest! Very comfortable atmosphere, location is fantastic and a very restful place to just "be together" and recharge your spirit. A great place to return to...often!! We LOVED the house, the view, the location,the ranch, the hot tub and Cambria! The owners should purchase new bath towels. The current towels are small and feel like sandpaper. Waking up to an ocean view,enjoying coffee on the patio, scenic walks, quaint town, Hearst Castle down the road, wonderful cooking options, helpful folks at Breen = A WONDERFUL PEACEFUL WEEKEND!! THANK YOU! A darling home with lots of things to do. Just the view alone is stunning. A short 2 minute walk to the Fiscalini Ranch is awesome! Hot tub is divine! We loved the location of this rental as we were steps away from an off-leash dog park, had a view of the ocean and were able to use this house as a base for our exploration of the area. The overall stay was very nice. There were a few problems. The spa was not well maintained. The water smelled of alge. The kitchen floor had not been mopped and there were several spots on the living room carpet. Our only complaint is the floors were not washed very well. It was swept well, but my white socks got dirty very quickly - especially in the kitchen. Otherwise, very clean. We had a great time. It was perfect for the dog and I loved the location. Overall it was a good place to stay. The negatives: There were some mud stains on the carpet in the living room, no wash cloths, the dishwasher had not been emptied from the previous guests, and the masterbedroom bed could use a pillow-top for added comfort. The positives: great view, location, access to the ranch and beaches. Great location, everyone was nice and helpful. I would come back and recommend to a friend. The place was wonderful. I would recommend to anyone. The perfect title for this house and its location! The best vacation I've had in years! Restful, quiet, comfortable. Recommend this place...most definitely...enjoy! Loved falling asleep to the sound of the waves, and waking up to see the waves crashing - the living room and master bedroom are sublime! Great location - just steps away from tide pools and "The Ranch" (open space preserve with many trails). Beautiful residential neighborhood in a very quaint town. If you are coming to Cambria be prepared for the fog, it is part of the charm of staying here. Once the fog lifts, the condo has a beautiful view of the ocean and a lovely trail down to the water just a few yards away. The condo has everything you could possibly want if you choose to stay in and is close enough to town or Paso Robles if you choose to go out. It was a very relaxing weekend. We thoroughly enjoyed our stay. The location was perfect with easy access to the beach and to the Fiscalini Ranch. We particularly enjoyed our walks through the Ranch. We have been missing the walks since we left. We have two minor comments. It would be good to have a couple of folding chairs available for the dining room table if you have six people staying. Also, the pull out sofa was not very comfortable. It could use some type of an overlay that could be stored away during the non sleeping time. I did expect 2 baths and there were 1.5--a few more glasses--only 6 in the cupboards-we were always washing glasses. Great ocean and Otter Cove views. The hot tub was wonderful, but a bit challenging when it came to getting the cover back on the tub. The home is comfy-nice furniture in living area except a comfy chair in the corner would be great for reading and views and something more comfortable to sit in on the deck while enjoying those wonderful views, sunsets and a glass of some great local wine would further enhance the vacation experience. Neighbors were friendly, proximity to the Fiscalini Ranch and trails was great. Rear yard was a safe place to keep the dogs when we were not home-and enough room for 3 cars-one in garage and 2 in the driveway-good to be able to accomodate the no street parking request. Master bedroom views were devine! A Central Coast Jewel & takes dogs, too! We booked this property because it took dogs. The home is lovely, really close to the coast & tidepools, the town of Cambria is cute but doesn't allow dogs on city beaches. LOTS of water sports around in nearby Cayucos & their beaches allow dogs. Close to Hearst Castle. Nice hot tub. Fun. Would have been nice to have access to the garage (we payed enough to be able to use the whole house - the garage was empty). We had a great time at the "Crow's Nest". The weather was mixed but, the last day and a half were exceptional. Love the Fiscalini Ranch for some good walks. Great spot for two or a family with youngsters. Cozy house just right size for two people. Hot tub adds to the stay. Close proximitiy to hiking trails and beach exploration. Gas barbeque was not working. Gas tank not filled. Could not use garage (locked)even though description said it was available. We enjoyed the wonderful ocean walks, bike riding to moonstone beach, hiking, and listening to the waves crashing on the rocks at night. Property management was exceptional. The location is wonderful, and the property is clean and comfortable. Be aware of steep steps in the house you'll be going up and down a lot. Great for a small family. 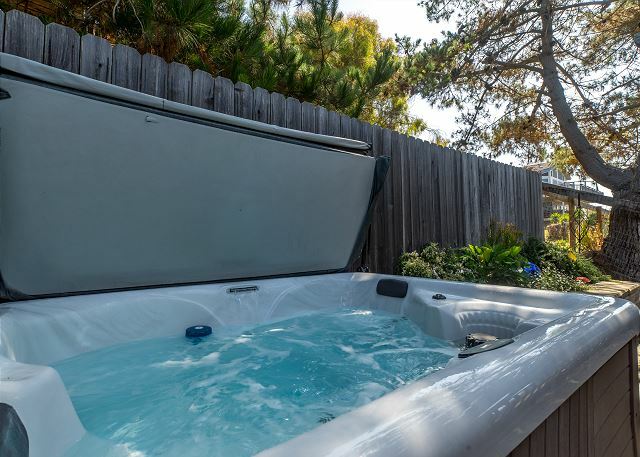 The jacuzzi was large and private, and there is a small patio area in the back. this is a very nice place and in a wonderful location. looking at the ocean from your balcony is one of the most relaxing things to do on this planet. my only problem was the hot tub would not get past 71 degrees but this was not a priority. I was going to call your office but it slipped my mind. my only regret is that I don't live here. Had a great visit again! We did overall have a very nice stay. We arrived around 2:00pm but were not able get into the unit until after 3:30pm when we were told we could get in earlier and after traveling over 5 hours we were ready to get into the unit. The towel holder in the downstairs bathroom came off and the there was no bromine for the spa to keep it sanitary minor stuff but over all I think we would rent this unit again. Within walking distance to the ocean and many trails available for exercising the doggie.